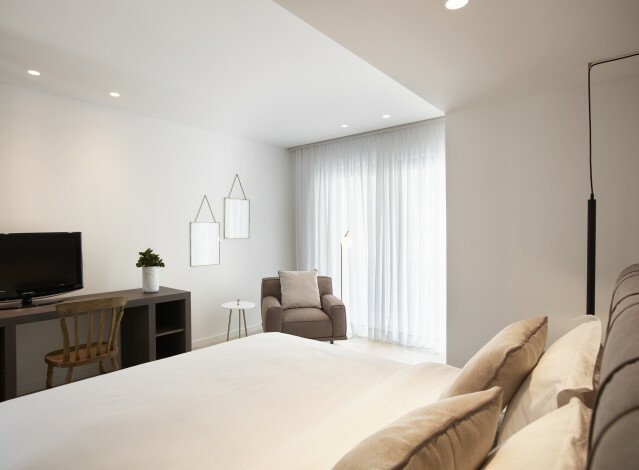 Discreet luxury, elegance and all modern amenities create a feeling of warmth and hospitality, providing visitors with a truly relaxing and comfortable experience. Deluxe Double Rooms cover areas of 25-32 sq.m. and consitute an ideal choice for 2 guests. A double bed and a stylish sitting area with a sofa are available. Meanwhile, the luxurious bathroom offers an elegant shower and branded toiletries. From the private balcony, guests can enjoy pool or side-sea views and feel the comfort and relaxation they are in need of during their holiday. 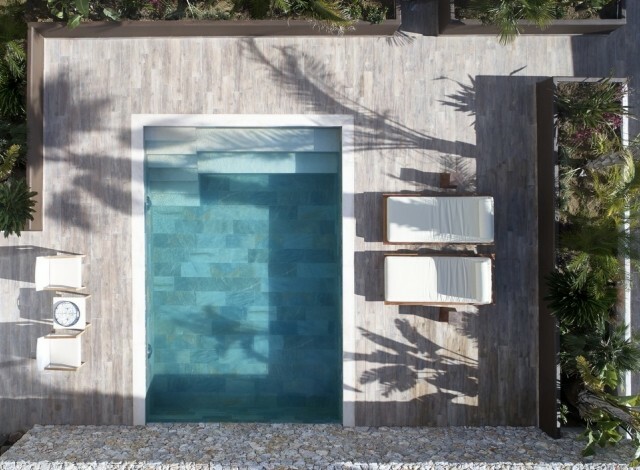 At the two Deluxe Sharing Pool Suites, discreet luxury matches with comfort and relaxation to compose the ultimate stay. Up to 36 sq.m., Deluxe Suites can comfortably accommodate 2 guests, providing a double bed and tasteful furnishings. From the private balcony, guests can enjoy the view of the enchanting pool area of the hotel or side views to the Aegean. The ultra modern bathroom area offers a shower and branded toiletries. This is your choice if you wish to enjoy a luxurious stay combined with the exclusivity of your sharing swimming pool. 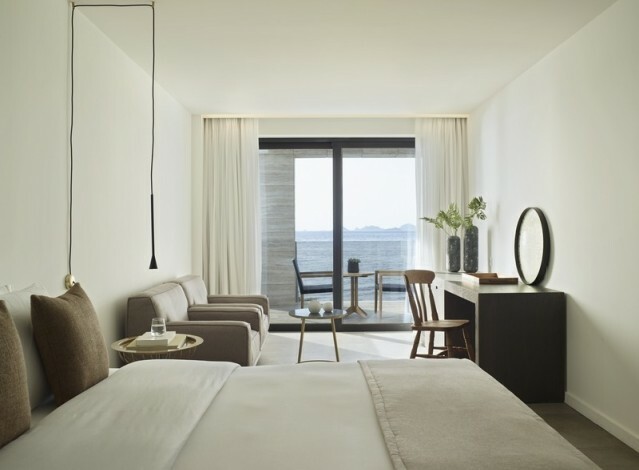 Cherishing magnificent views to the Aegean from the private balcony, Junior Suites provide luxury, finesse and style within a serene, relaxing ambience. 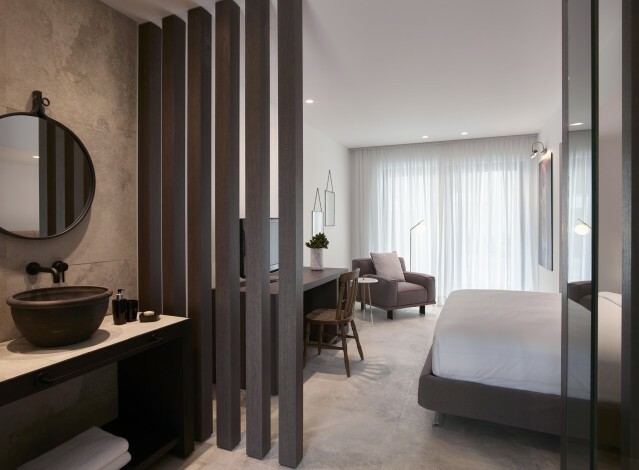 Minimal décor, exquisite furnishings and an open plan layout, compose the perfect hideaway for exclusive holidays in Kos. Covering areas of 34 sq.m., the suites can comfortably accommodate 2 guests and offer an elegant sitting area. 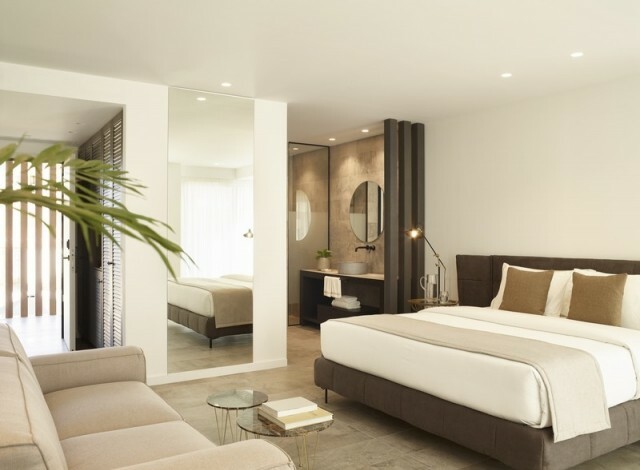 The Queen size bed guarantees the perfect sleep experience, while the modern bathroom area offers a luxurious shower and fancy toiletries. Admire the breathtaking sunset from your private balcony and experience an unforgettable stay in Kos. Elegance, style and minimal décor meet with extra doses of space, affluence and comfort to create a luxurious haven in Kos. 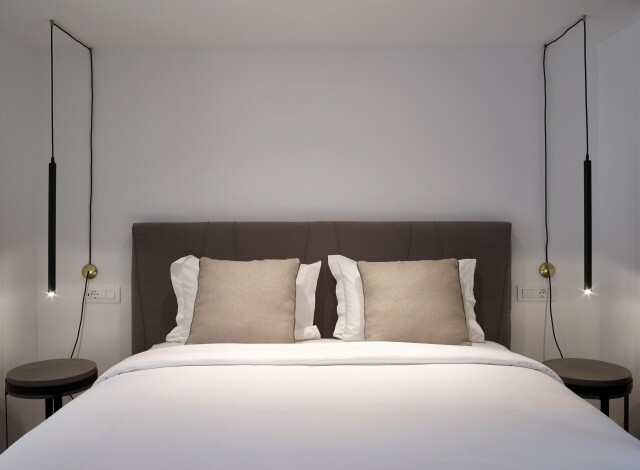 Up to 40 sq.m., Deluxe Suites form an ideal choice for 2 guests, providing a double bed and a tasteful sofa. From the private balcony, guests can enjoy the view of the enchanting pool area of the hotel or side views to the Aegean. The comfortable bathroom area offers a modern shower and luxurious toiletries. 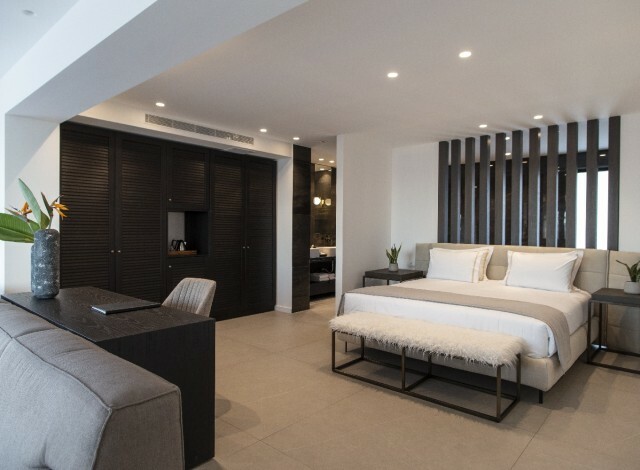 Feel relaxed at your modern, minimal suite and enjoy a truly memorable experience in Kos. Designed to spoil the most discerning guests’ during their holidays in Kos, Master Suites constitute the top selection of the hotel. The suites reflect the absolute luxurious holiday in Kos, offering discreet luxury, space of up to 70 sq.m. and affluent facilities. From the private terrace, guests can enjoy unobstructed views to the deep blue of the Aegean and soak into the outdoor Jacuzzi that promises to offer hours of relaxation. The suites can ideally sleep 2 guests at a Queen size bed. The spacious and elegant bathroom area offers a bathtub and a shower. Dive into your outdoor Jacuzzi, relax at the outdoor lounge area and admire Kos’ breathtaking sunset from your private balcony, experiencing the ultimate stay. Suites with private pool are designed to offer guests the ultimate exclusivity and privacy throughout their holiday. 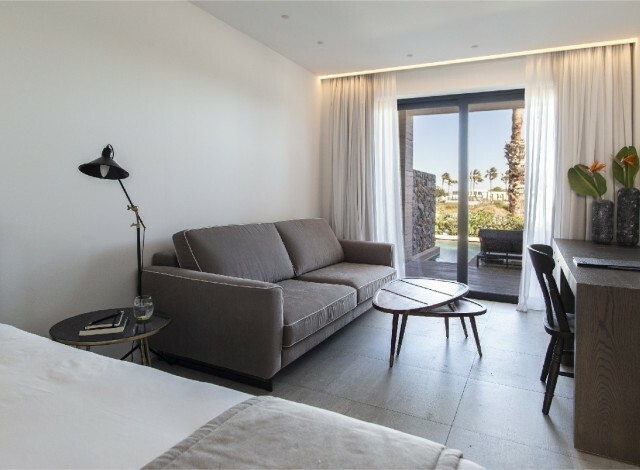 At the indoor areas of the suites, sophisticated luxury, elegant furnishings and modern amenities perfectly match together to create the perfect hideaway in Kos. The spacious suites of 45-50 sq.m. can comfortably sleep 2 guests at a Queen size bed. 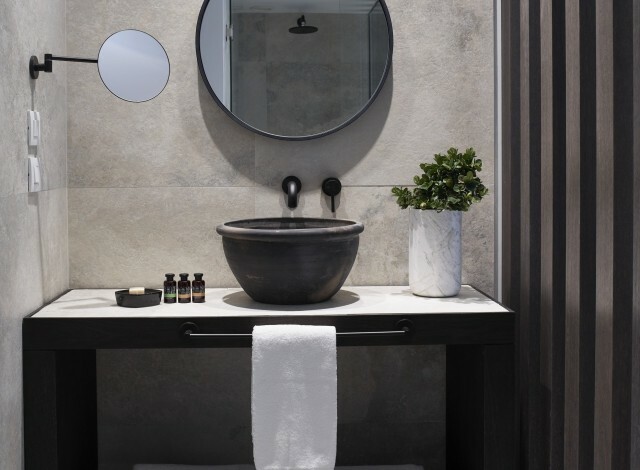 The luxurious bathroom area offers a modern shower and elegant toiletries. Dive into your private pool, spend hours of relaxation at your balcony or patio and enjoy the absolute relaxing experience on the island. Your own private swimming pool and the generous, luxurious indoor spaces guarantee you will hardly wish to abandon your suite during your holiday in Kos. Superior Suites with private pool vary from 45-50 sq.m. and offer minimal luxury, total privacy and all modern comforts and amenities. They form an ideal option for 2 guests, offering a double bed and an elegant living area with a sofa. The modern bathroom offers a luxurious shower and elegant toiletries. Enjoy hours of relaxation under the Aegean sun at your patio, dive into your swimming pool and experience the essence of the Greek summer.